Despite claims by Goldman Sachs (GS) that it upholds its responsibility to clients, evidence gathered by a Senate subcommittee shows that the company was making short-sale bets against the mortgage-backed securities it sold to investors in 2006 and 2007. "The evidence shows that Goldman repeatedly put its own interests and profits ahead of the interests of its clients," said Sen. Carl Levin, D-Mich., at a press briefing Monday afternoon. Levin is chairman of the Senate Homeland Security and Governmental Affairs Committee's Permanent Subcommittee on Investigations, which is holding a day-long hearing Tuesday focusing on Goldman Sachs's role in the financial crisis. Seven Goldman officials, including Chairman and Chief Executive Officer Lloyd Blankfein and Executive Director Fabrice Tourre, are scheduled to testify. Goldman Sachs and Tourre were charged April 16 by the Securities and Exchange Commission with securities fraud for their role in marketing a collateralized debt obligation obligation in which New York hedge fund Paulson & Co. had influenced the selection of some of the underlying subprime mortgage securities. In his prepared testimony, Blankfein denied that the firm bet against its clients, and said the company can not survive without their trust. "If our clients believe that we don't deserve their trust, we cannot survive," Blankfein said, according to an AP report. But Levin said the evidence uncovered by his subcommittee shows otherwise. "For large fees Goldman helped run a conveyor belt that dumped hundreds of billions of dollars of toxic mortgages into the financial system," Levin said. That provided the lenders with liquidity so that they could issue still more bad loans, he said. Goldman Sachs used financial engineering to turn the high-risk mortgages into investments that were granted AAA ratings, selling them to pension funds, universities, municipalities, insurance companies and banks throughout the world, according to Levin. "The subcommittee has determined that, contrary to its public pronouncements, in 2007 Goldman Sachs shifted direction, and placed heavy bets against mortgage-backed securities that it had created and that it was selling to its clients," Levin said. The company established and then cashed in large short positions that held in residential mortgages and related instruments. While Goldman lost a lot of money in 2007 when it decided to sell its long positions in mortgage-backed securities, it more than recouped those losses with $3.7 billion in profits it made from shorting that market. Levin particularly disputed claims by Goldman that it was simply moving to a more neutral, "balanced" position in mortgage investments in 2007. "By early 2007 the company blew right past a neutral position on the mortgage market and began betting heavily on its decline," he said. The short positions at one point represented about 56% of the firm's risk as measured by the most relied-upon risk measure, called Value At Risk (VAR), he said. The subcommittee has compiled more than 500 pages of documents, including numerous emails, showing that Goldman officials was moving away from investing in long positions in mortgage-backed securities beginning in late 2006 and continuing through 2007. "Of course we didn't dodge the mortgage mess," CEO Blankfein wrote in one email to Goldman Executive Vice President and Chief Financial Officer David Viniar, who is also scheduled to testify Tuesday before the subcommittee. "We lost money, then made more than we lost because of shorts." Some of the emails were reports to the company's board of directors on how it was taking short positions in the market. The company's decision to issue "synthetic" collateralized debt obligations, which contained no assets other than references to mortgage-backed securities, made it a "gambling house," rather than an investment bank, Levin said. 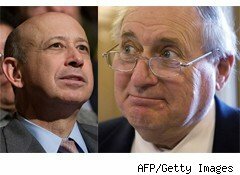 Goldman Sachs' behavior was probably similar to that of other investment banks, Levin said. The subcommittee will decide whether to refer the Goldman case to the SEC and the Department of Justice for possible action. "They misled the country, and they were not fair to their customers," he said. Levin also called on the Senate to take up the financial reform bill. The Senate is scheduled to take a procedural vote this afternoon to determine whether it has at least 60 votes to avoid a Republican filibuster. Republicans, who have 41 seats, have said they will block the bill until they can get agreement on some measures they want in the bill. Levin is sponsoring an amendment to the financial service legislation with Sen. Patty Murray, D-Ore., that would prohibit bank holding companies such as Goldman Sachs from engaging in high-risk proprietary trades, and would only allow non-bank financial companies from engaging in proprietary trading if they meet stringent capital requirements. The amendment also would address conflicts of interest at brokerage firms.